The smallest things can make a big difference, and Boettcher Scholar Suzy Luff is proving that every day. Suzy, a junior at the University of Denver, is the founder of Hats 4 Hope—a Colorado nonprofit that provides hand-knit hats for premature newborns who are too small for standard hospital-issue hats. Not only do the hats provide warmth to tiny bodies that can’t regulate their temperatures; they also provide hope and connection for parents struggling with the overwhelming issues related to extremely premature births. A 2012 graduate of Colorado Springs Christian High School in Colorado Springs, Suzy started Hats 4 Hope after receiving a knitting loom in the eighth grade. 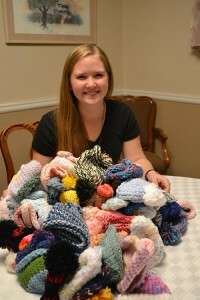 She began knitting hats and donating them to her local neonatal intensive care unit. Not content to stop there, she visited classrooms at her school, recruited volunteers and hosted knitting parties to gather still more hats. Today, Hats 4 Hope has donated nearly 10,000 hats to neonatal intensive care units. The organization has grown to include five chapters outside Colorado, and it recently partnered with infant formula-maker Abbot Laboratories to lead a worldwide initiative to knit and donate hats in honor of World Prematurity Day. While she ultimately plans to be a middle school mathematics teacher, Suzy says there will always be room in her life for Hats 4 Hope. “I’m going to keep with it as long as there are volunteers to make them and hospitals to give them to,” she says.